Antagonistic. That was what the weatherman called today’s weather. Sunny one minute and wild rain squalls the next. I would probably have described it as turbulent or unsettled, but I like the weatherman’s word better. In any case, it made for great skies and it reminded me of something I’ve been meaning to post. I did a test some weeks back on Cerulean blues made by different manufacturers, in part because I wasn’t happy with the way some paint on my palette was performing. I have always thought I wasn’t brand loyal — any artist quality paint would be fine, especially if it was on sale — but I have lately come to realize that with some colours the brand can make a huge difference. Other painters have probably come to this conclusion already, but I think I’m only noticing it as I start to work on larger sheets of watercolour paper. The problem I was having was that Daniel Smith Cerulean was very weak and if I tried to get a more saturated mix, the colour would get no deeper. 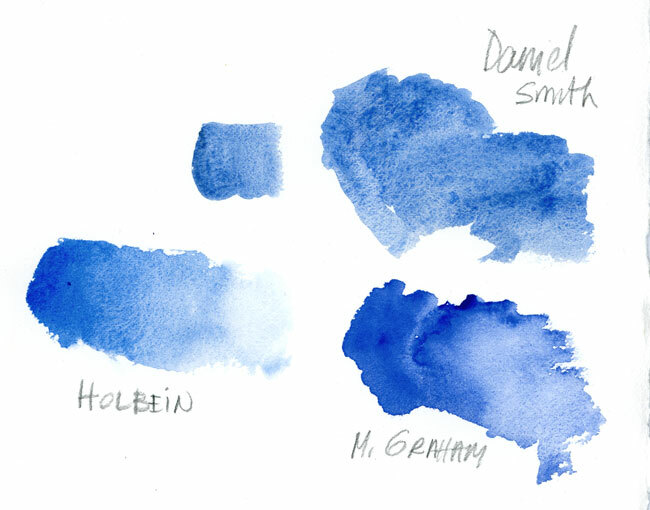 The test I did was to compare M. Graham and Holbein Cerulean with the Daniel Smith (unfortunately I had no Winsor Newton on hand to add to the test). The results are below. As you can see, no matter how little I diluted the paint, I could still not get an intense blue compared to the Graham and Holbein samples. I have since replaced that blue with the M. Graham pigment and I’m much happier. 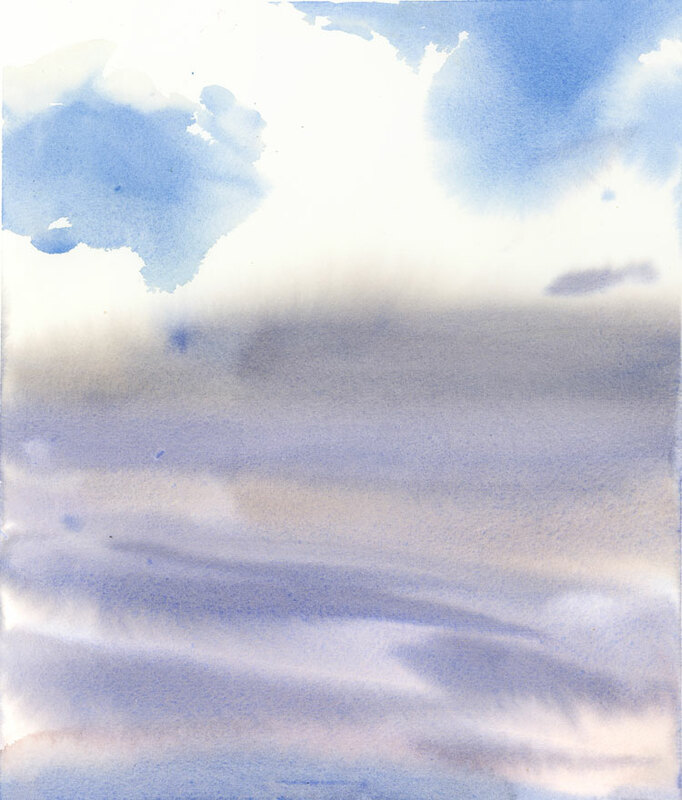 And the sky practice below is one I did on Lopez Island this summer in the Tom Hoffman workshop. Thanks, Shari. I’ve always thought that the Daniel Smith granulated more than I liked, so now I have two reasons to try a different brand. The sky is gorgeous! Thanks Vicky. I have also recently gone back to using only Winsor Newton Burnt Sienna because the other brands just don’t have the same depth of colour. They all seem a bit flatter but I guess I will have to another test for that one too. You know I take notes from your observations Shari. You are right about the intensity, but I really like the granularity of the Daniel Smith mix. Part of the fun for me is the uncontrollable aspect. You should try some Manganese Blue. That granulates and surprises even more. I like uncontrollable too, on occasion, but I find that when I paint sky the blue just has to be right and the Daniel Smith often seems to go dull. I’m wondering if anyone has tried Daniel Smith Cerulean Blue Chromium vs the standard Daniel Smith Cerulean. When I searched to find someone who understood the chemistry behind pigmentation, it was the Chromium version that was on their list of ‘must haves.’ So I have not painted with the regular one…. However I also use Holbein cerulean blue and on a scale of intensity, it is less intense than the Daniel Smith Cerulean Blue Chromium. So if you need an excuse to try another tube….. try that one and let me know how it works for you. Thanks for this tip! I will certainly give it a try, especially now that Daniel Smith paints are readily available in Montreal. Hi Jody, I’d love to learn more about what you said…. what does PB stand for? I will check that out Jody. I am not very scientific with the colours but if I’m not sure I always consult Handprint.com. From what I can see the DS and M. Graham are PB 36 whereas Holbein and WN are PB 35. Good to know! For TR: if you look at Handprint.com you’ll see an analysis of each watercolour pigment and PB stands for the pigment name. Many painters choose their pigments based on this info. I am more intuitive but I find the study of it all fascinating nonetheless. Hm…. when I check the DanielSmith site the regular cerulean says (PB35) and the cerulean chromium is (PB36) that might be the difference I was seeing… although it doesn’t match what Jody said about Reardon’s preferences. and thank you I learned how to find the PB number on my holbein paints! but does anyone know what PB stands for? Jody, not long winded at all and thank you for your knowledge! and helping me understand pigmentation. I love that you went to a geologist painter to get information. I was sent to Handprint when I asked to learn from someone who understood pigment at a design chemistry level. ( I’m an architect trained in cradle to cradle concepts, so wanted to understand it from that perspective.) AND YES! I’m totally taken by many things about Shari’s style… and the fresh colour quality is just one of her gifts…. I’m often asking how she got a colour…. (curious that for her it is intuitive!) for me learning about transparency and not getting colours that muddy up.. helps immensely. perhaps Shari can share my email with you and we won’t be clogging up her blog with ‘muddy’ pigment conversations? I’d love to learn more as we go along. Shari thank you for helping us so much in the grand adventure of exploration and expression!